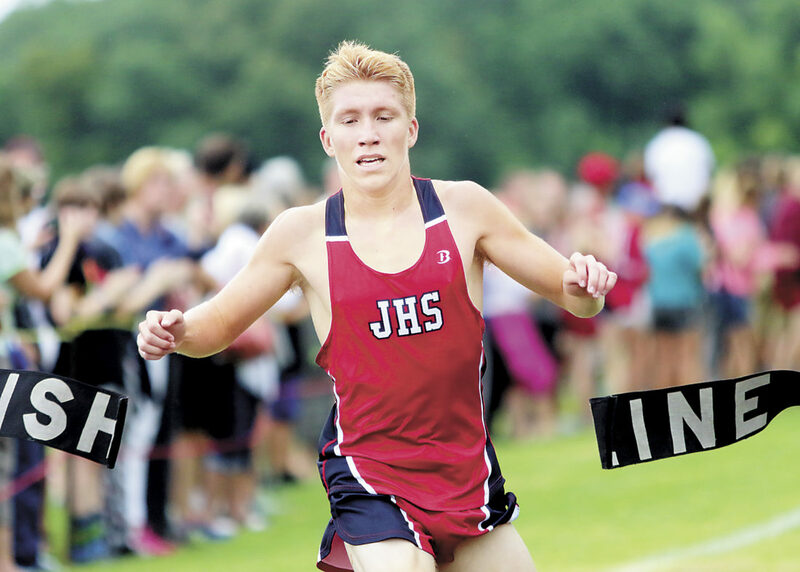 Juniata’s Garrett Baublitz crosses the finish line first to win the varsity boys race at the Big Valley Invitational cross country meet Saturday in Reedsville. MILROY — Juniata’s Garrett Baublitz captured the overall boys’ championship, while the Mifflin County duo of Chayce Macknair and Brayden Harris finished first and second in the Class 3A division at the Big Valley Invitational on Saturday. Baublitz, second at the BVI a year ago, crossed the finish line in 16:21 to give the Indian junior his first Big Valley title. Baublitz didn’t have any particular strategy for the race — just get out quickly and stay near the front.“I didn’t have much of a plan. I wanted to get a fast start and either lead it or stay in the head pack. I ended up leading it and it just worked out that way. I didn’t plan for that it just happened. I’m happy it went that way. I got to control the race a little bit,” Baublitz said. Baublitz clocked in with a slower time than a year ago. Juniata coach Jeff Miller said the plan was to run a tactical race, not focusing on time. The Husky duo of Macknair and Harris finished neck-and neck down the stretch with Macknair breaking the tape in 16:28, good enough for third overall, and Harris coming in with a time of 16:29 for a fourth-place overall finish. Harris said having a teammate like Macknair to push him is invaluable for the sophomore’s growth as a runner. Their performance helped propel Mifflin County to a second-place team finish with 92 points. State College won the event with 53 points. Chase Sheaffer (17:48) was next placing 17th, followed by Seth Phillips (18:05) in 22nd. Juniata finished fourth in Class 2A and ninth overall. Clay Yeager (18:25) came in 30th while Albert Heister (18:50) placed 42nd. On the girls’ side, Joy Galbraith placed eighth overall for Mifflin County with a time of 20:44 — seven spots higher than last season. Lauren Kuykendall (21:41) at 17th was the only other Husky harrier in the top 20. For their efforts, the Huskies finished fourth in the overall team standings with 178 points. State College won the event with 24 points. Juniata had three girls run with Emily Houtz leading the way. The sophomore came in 24th with a time of 22:18. Jordan Reed of State College won the girl’s race with a time of 19:55. Mifflin County hosts Cumberland Valley on Tuesday, while Juniata competes at the Kutztown Invitational on Saturday. 3. Chayce Macknair, 16:28; 4. Brayden Harris, 16:29; 17. Chase Sheaffer, 17:48; 22. Seth Phillips, 18:05; 46. Mason Schomaker, 18:56. 1. Garrett Baublitz, 16:19; 30. Clay Yeager, 18:25; 42. Albert Heister, 18:50; 57. James Hazzard, 19:41; 69. Zebulon Ames, 20:15. 8. Joy Galbraith, 20:44; 17. Lauren Kuykendall, 21:41; 46. Julia Montgomery, 23:16; 52. Morgan Robinette, 23:51; 55. Rachel King, 24:03 . 24. Emily Houtz, 22:18; 55. Carli Walters, 23:49; 68. Sydney Houtz, 24:29.